In TOP 9 of Foodbuzz, on the 20th of August 2011. 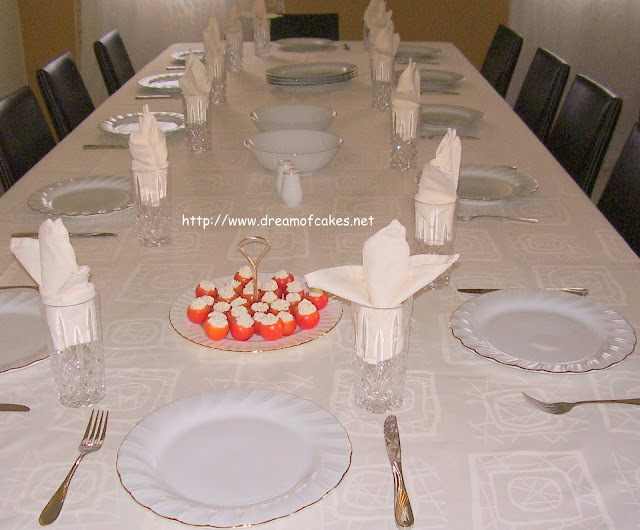 On the 15th of August my husband and I, invited both our families for lunch. A total of 18 people. We had souvla, souvla potatoes, pasta (pastitsio), cherry tomatoes stuffed with tyrokafteri, potatoes “boom”, as I call them, (patates antinaxtes), various salads and Greek yogurt. Below you will be able to find photos of some of the dishes. For dessert I made a New York style cheese cake, a fruit salad and ice cream. 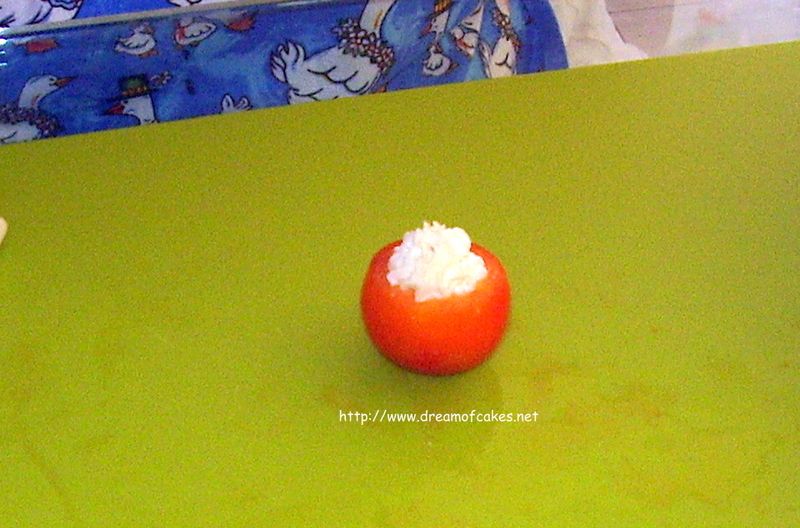 Here I will give you photos of all the steps on how to make these stuffed tomatoes. 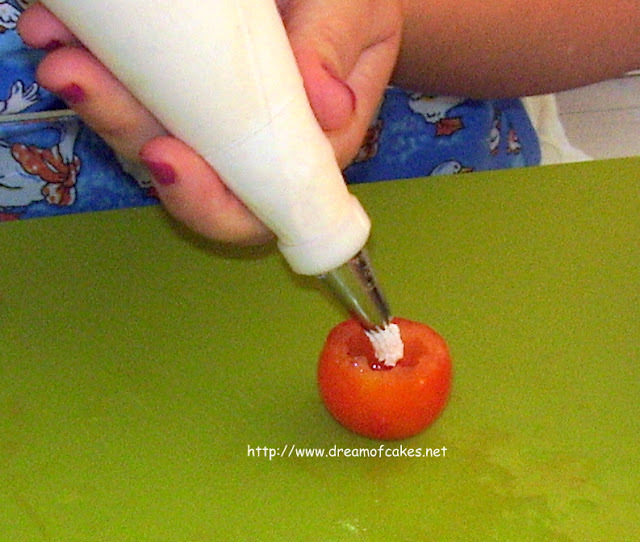 1) With a knife cut the upper part of the tomato. 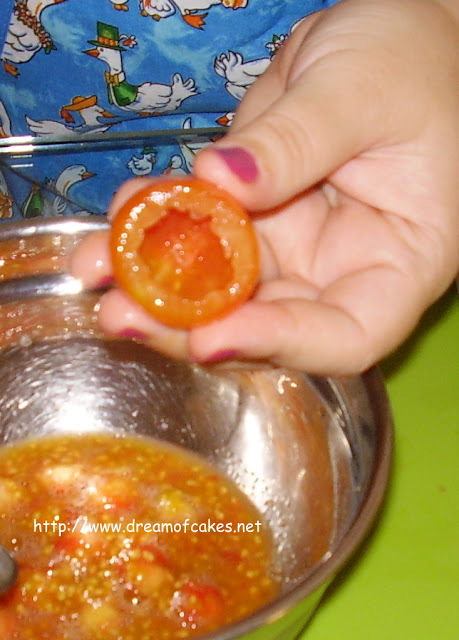 2) Using a small teaspoon remove the tomato seeds. 3) In a bowl mix the cheese, thyme and oregano. 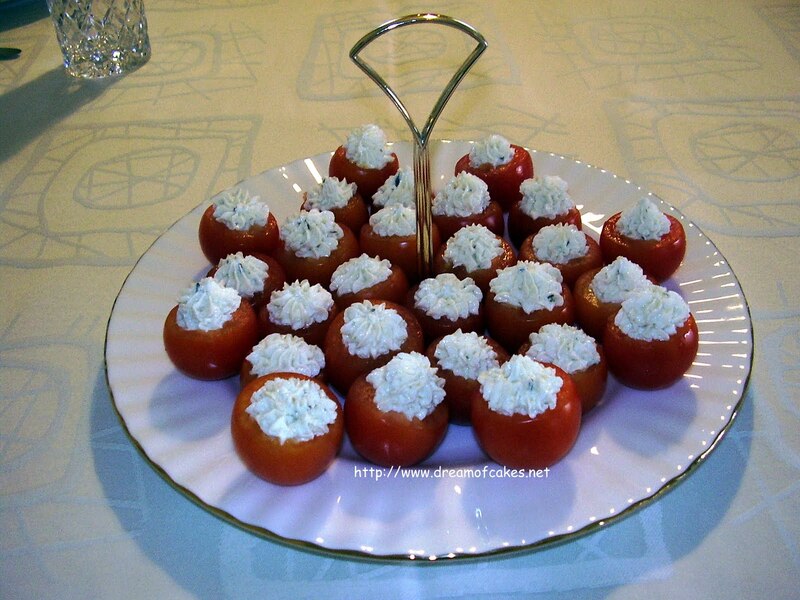 4) Fill the tomatoes with the cheese. 5) Serve immediately or in a few hours. *Tyrokafteri is a spicy creamy cheese salad. Tyro means cheese, and kafteri means hot. 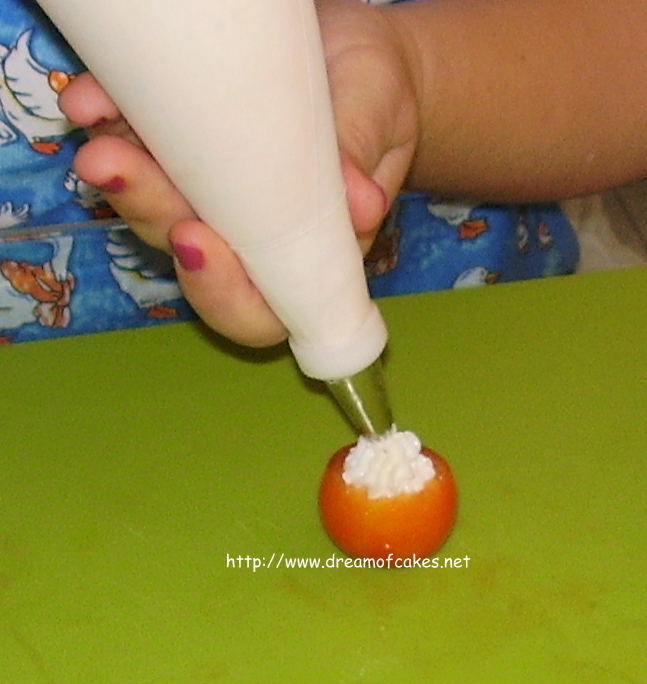 I used a ready made tyrokafteri, but if you want to make it yourself, you can find the recipe in Ivy’s blog Kopiaste. Gather all necessary equipment before you start making this recipe. With a knife cut the upper part of the tomato. 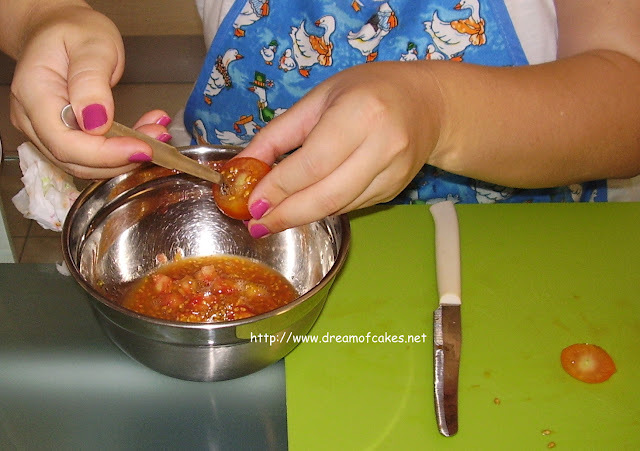 Using a small teaspoon remove the tomato seeds. Fill the tomatoes with the cheese. This is our dinner table. 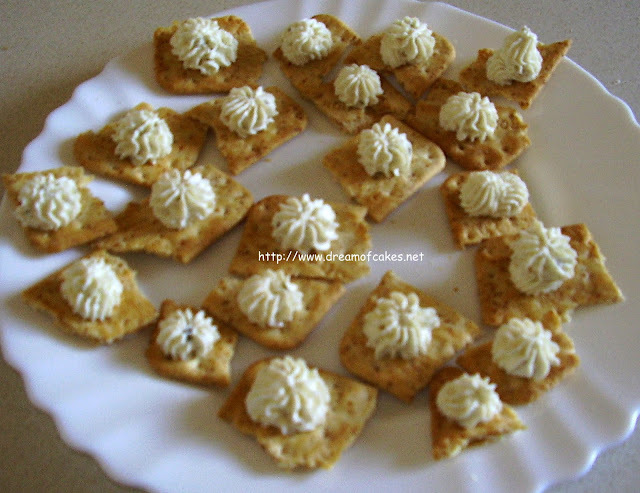 I had a few filling left, so I decided to prepare some finger food for our guests. This is the way we cook souvla in Cyprus. This is the way we use charcoals to cook in my country. 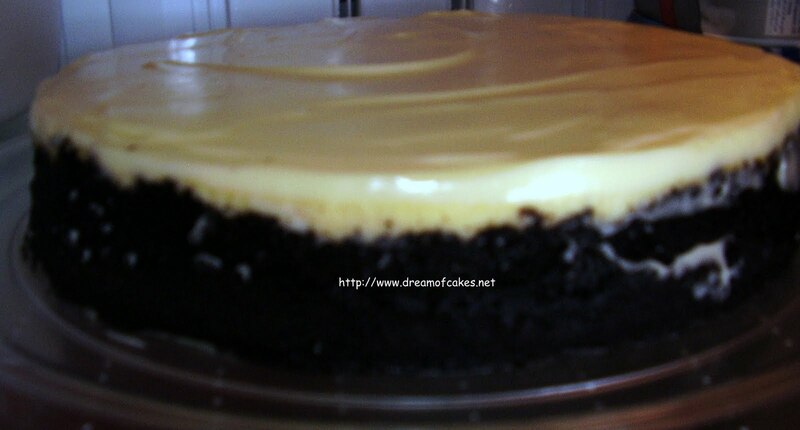 New York style Cheese Cake, with oreo cookies for the base. I added some caramel and chocolate chips in the cheese filling. Our guests enjoyed the lunch and we all had a great time! 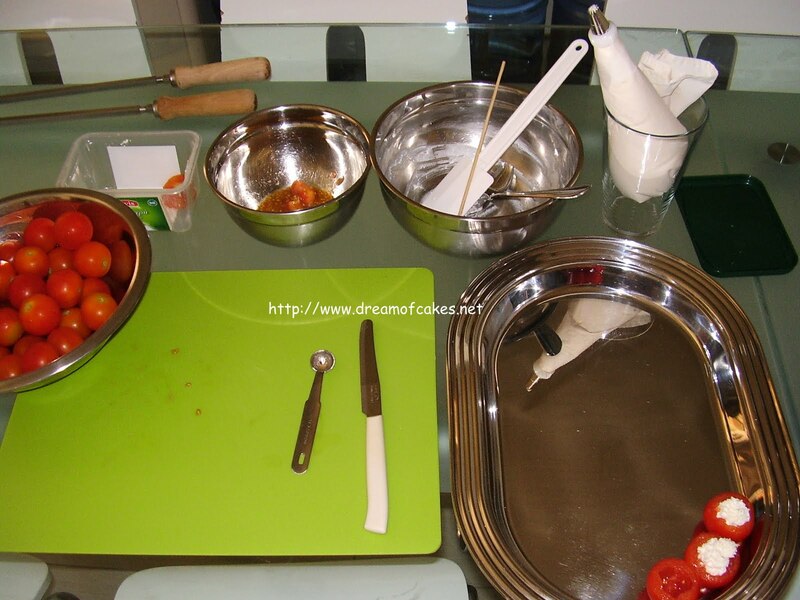 Love your blog and the authenticity of your recipes! Great recipe to try for entertaining! I'll be sure to visit more often! I loveeeeeeeeeeed the filled tomatoes. 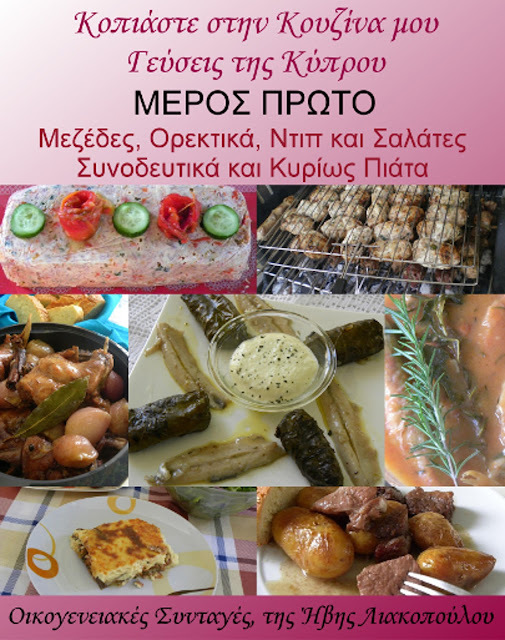 If I ever make it to Cyprus, I want to have lunch at your house!! What a beautiful lunch! I love stuffed tomatoes but never considered making them spicy before. Thanks for sharing! Yum!! Those tomatoes sound really tasty! Wow what the food! No wonder everybody had a good time the food was so fabulous. Looks like you all had a fabulous meal! Oh my goodness - how lovely - a banquet on a banquet table. That is a huge table! So interesting - thanks for sharing. Wow! 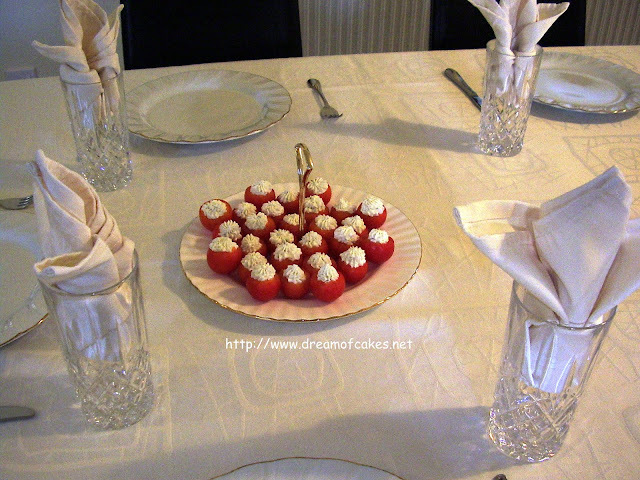 Everything looked delicious and the table was beautiful! I'm sure your guests had a delightful time! Helo there, this looks great, my cherry tomatoes will be coming soon it will be a great reason for me to try these tomato... Have a great evening. Food looks wonderful. Table was beautiful. Hi ...the food looks delicious:) especially the NY cream cheese.Maybe you can share the recipe..pls. 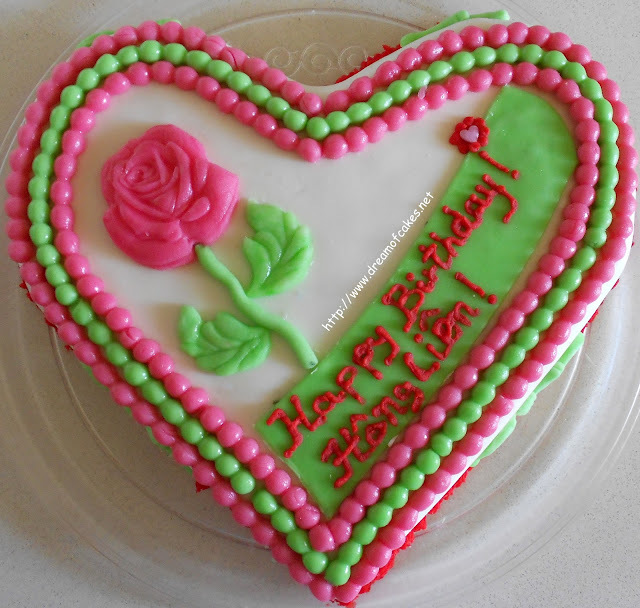 I love your blog... you are so talented, I like yr organic strawberry cupcakes. Ooh delicious. I want them! I love the hot and spicy tomatoes! Thanks for the recipe and demo. Sounds like a great party. I hope to one day visit Cyprus. Your guests must have been very very happy! ME Amazing?? THIS is gorgeous and amazing!!! Absolutely lovely table lady and cherry tomatoes love me beyond measure. Hence why I love them too. Definitely going to make these!!! Very nice. I don't know if I like your lovely stuffed tomatoes or your charcoal grill better; each one of those things hits me in a tender spot! Thanks! ingenious creation! :D cheese filled tomatoes!! congratz on making top 9 on food buzz! Congrats on Top 9...just saw it! So well deserved, & I BUZZED you again!! 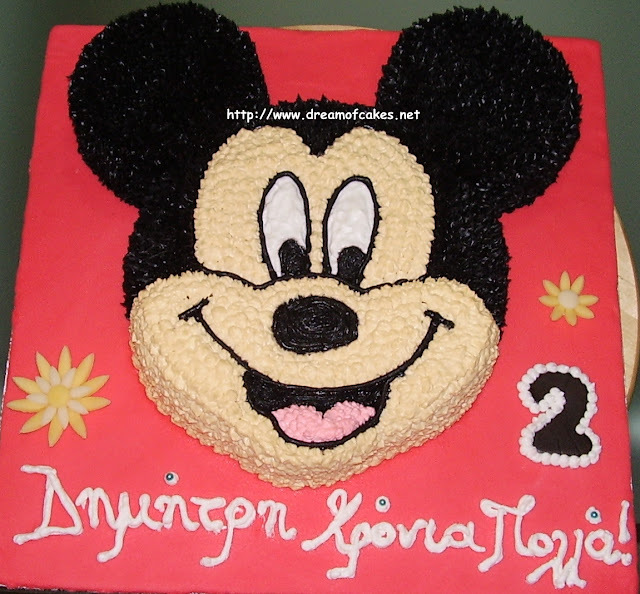 Thank you so much for your nice comments! I am very happy I made it again to the Foodbuzz Top 9!!!! Beautiful! Your pictures are great. I can't wait to try your recipe! I think the meat cooking mechanism looks interesting. 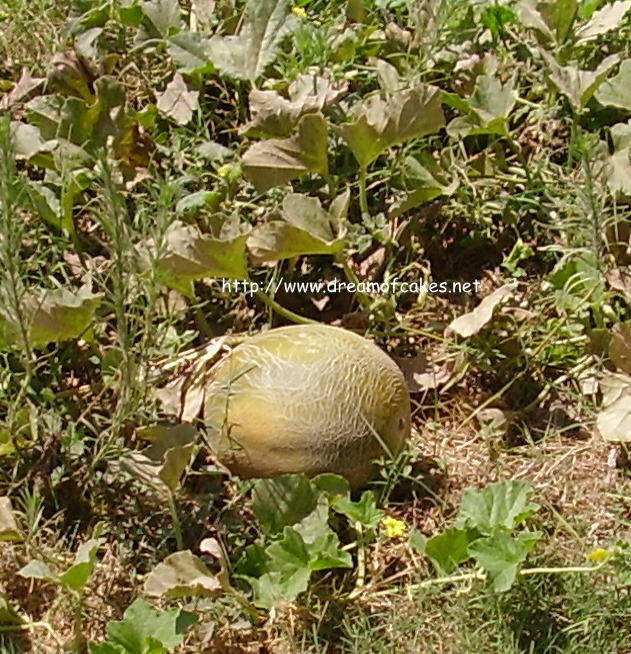 Any place I could read more about it, or any chance you are going to write more about it? You had some lucky guests! Tomatoes look GREAT! How pretty! They are a great appetizer. 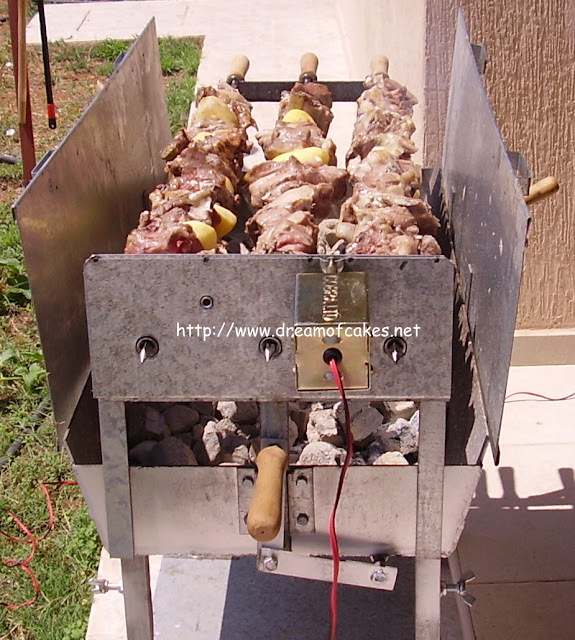 About the souvla mechanism, you can google it as souvla machine. I will try to post information about this, since we know people that create such machines. Just give me some time... Thank you! Congratulations again on making it to the top 9. 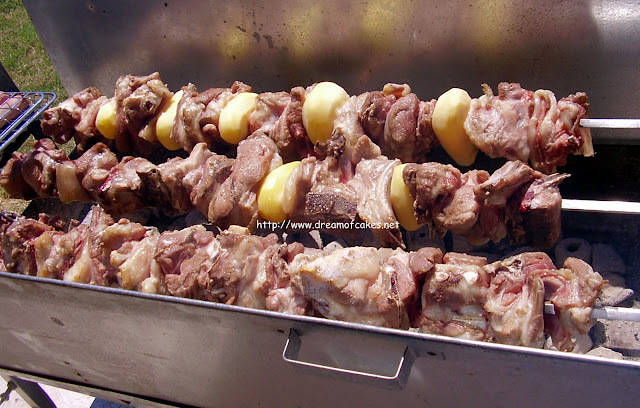 Everything looks delicious, especially souvla. Thanks also for the mention. I'm drooling over your pictures! To bad that you're so far away! I LOVE the souvla! That looks soooo good! These look so good. I'll have to try this. And your photos of souvla made me miss Cyprus terribly.